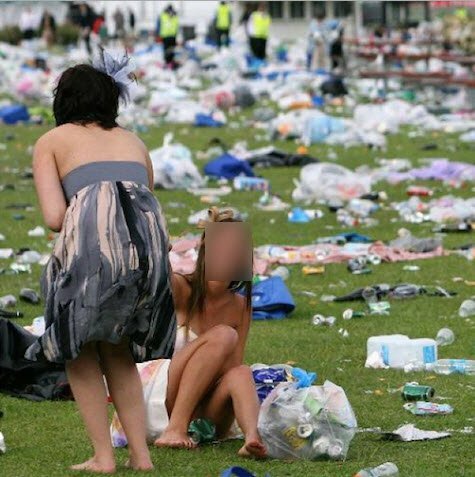 OPINION: 'Sympathy for the Drunk Girls Of The Melbourne Cup? Nope.' - Em. Let me be perfectly clear about something. If you go to a huge, nationally-televised public event teeming with media, drink 57 breezers in 27-degree heat, take a nap in a garden bed and then end up on an Instagram account called “Drunk Girls of Melbourne Cup“, that is called ‘consequences’. Yesterday, some people at took photos of inebriated race goers and then created an Instagram account called: The Drunk girls of Melbourne Cup. This was not a nice thing to do. Funny but not nice. Life, however, is not always nice. Today there has been some public/media outrage over the account, saying that it exploits women blah blah blah men don’t get ridiculed for similar behaviour blah. First up I want to say that I don’t feel any sort of kinship or sisterhood towards the woman with filthy feet riding her boyfriend like a pony sans underwear for all to see. I don’t feel like she’s been victimised nor do I feel she needs protecting. It’s just a seemingly sloshed girl riding her boyfriend like a horse. I also don’t feel like she has been taken advantage of or exploited. She is not a victim of anything other than her own actions. I feel she should have slowed down on the contents of her esky, considered wearing a foundation garment and perhaps hydrated a little more. If these photos had have been taken in a private situation and leaked? Different story. I would have felt it was an invasion of her privacy. But this didn’t happen in private. 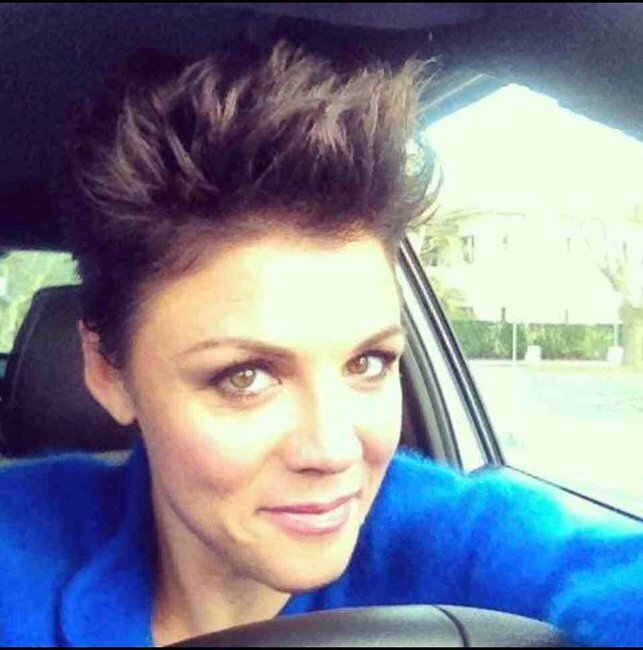 None of the behaviour depicted in the photos on this Instagram account happened in private. They all occurred in full view of tens of thousands of people with camera phones and hundreds of media including camera crews and professional photographers. If you’ve ever been to the Melbourne Cup then you know how the day usually progresses and inevitably ends. 9am: Well-mannered, well-dressed folk stream into the track. If you’re in the General public area then you may set up a lovely picnic rug and some folding chairs. Perhaps you’ve bought a cheese platter and a sparkling white to sip on. 4pm: WARZONE. Bodies lay strewn across the ground, rubbish covering every blade of grass, ladies with shoes in their hands stumbling around with tiny pieces of spew caught in their hat’s netting. Men relieving themselves on rose bushes and taking naps in the public toilets. It goes from garden party to a drunken zombie apocalypse in just a few short hours. This kind of behaviour has gone on for years, it’s just that now everyone has a smart phone with a camera on it and they’re not afraid to use it. The #DrunkGirlsofMelbourneCup account was set up on Monday and took full advantage of some attendees’ unsavoury behaviour. Truth behold I went and looked at the photos and I laughed, yes I laughed, oh how I laughed. I then showed my 13-year-old daughter. Her response? “Idiots”. Make no mistake, these photos are so bad they’re good, it is car-crash rubber necking at its finest. You don’t want to look but you can’t look away. Do you suppose people are offended because the sight of a woman so horrendously drunk unsettles them? Is it because getting raucous and rowdy under the influence is something they only expect from a man? Have they never been on schoolies? A hens’ party or the Diamond Creek under 28’s dress to impress no denim half price shooters night? Does it paint drunk women in a bad light? Yes. Does it paint drunk men in a bad light? Yes. Does it glorify binge drinking? A bit. Do I care about any of the above? Meh. Whatever the catalyst for your outrage may be I must tell you that these women and men in the photos put themselves there, plain and simple. All that aside, they seem to be having a bloody great time. I’m not even sure if any of the people in the photos are upset about it. 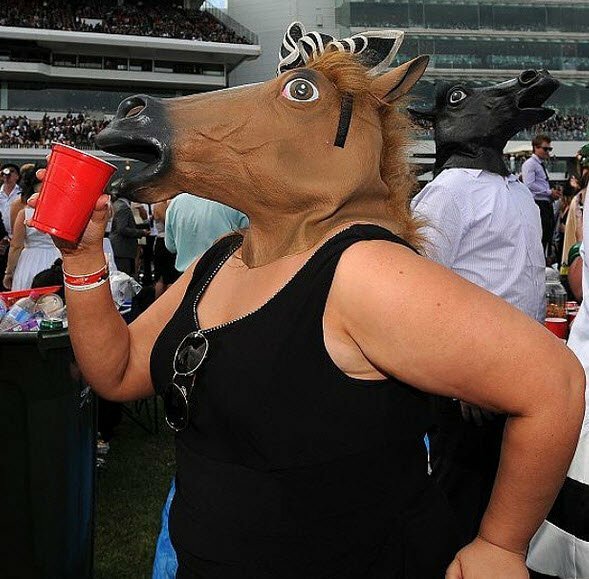 I know quite a few race-goers who nominated themselves for the account using the #DrunkGirlsofMelbourneCup hashtag. One person I know, found herself on the account and has made that shot her FB profile picture. She is wearing it as a badge of honour. On another note it blows my mind that these people spend hundreds of dollars on their dresses, hats, suits and shoes only to end up napping on dirt, covered in food while other people step all over them. Why bother? Why not just turn up in a garbage bag with a head hole cut out of it? Pop a serviette on as a fascinator and bring a sleeping bag too. In summary, if you deliberately get poleaxed at a public event and subsequently end up on a website dedicated to such behaviour; you are responsible for that. Because the alternative view suggests that we’re all walking around like potential victims all the time with no sense of personal responsibility for our actions. We truly are living in an age where any sort of self accountability is a rare and special thing, aren’t we? Click through our gallery below for photos from the #DrunkGirlsofMelbourneCup Instagram. 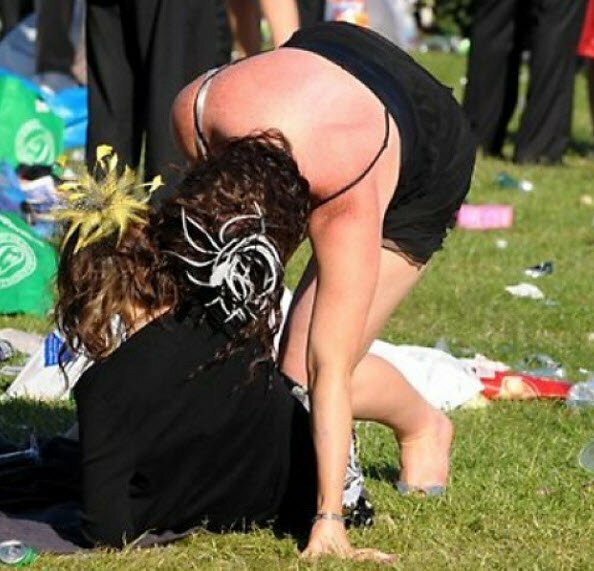 Drunk Girls of Melbourne Cup. Image via Instagram.